In the main area of the villa you will find spacious lounge area equipped with two settees, coffee table TV with UK channels , Hi-Fi, radio, cassette/CD player. To the rear, you will find a spacious dining area with table and 6 chairs. This area also contains a large cupboard, with sun beds, and room for suitcases. The kitchen comes fully equipped with washing machine, fridge freezer, oven and hob, kettle, toaster, microwave, coffee maker and espresso maker. . All utensils, crockery, cutlery and barbeque tools are on hand as you would expect. Second bathroom with shower, WC and wash hand basin. This is ideal for showering as you come in from the pool. Three bedrooms, Air- Conditioned Master bedroom with king - size bed, built-in wardrobe and chest of drawers. From the master bedroom you have direct access to the sun terrace with table and chairs. 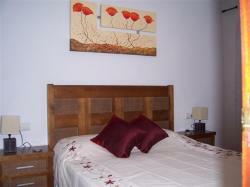 Bedroom 2, is equipped with two single beds and built-in wardrobe, view overlooking the communal pool. Bedroom 3, is equipped with two single beds and built-in wardrobe, sun terrace with table and chairs. 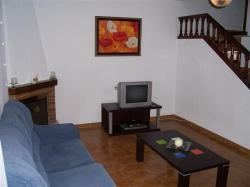 All bedrooms have been tastefully decorated and have new furniture. The main bathroom has a shower, bath, WC and wash hand basin. . The lower terrace has a table and chairs and a barbeque area. The Communal Pool is just outside the back door of this Villa. Close by and well within 10 minute walk there are plenty of bars on hand for that pre and after dinner drinks with some offering nightly entertainment. The Villamartin plaza, with its prominent palm trees and feature mosaics is a picturesque square with a wonderful collection of cafes, bars, restaurants and bowling alley to suit all tastes, and is also home to a family of parakeets. Large Supermarket approx 5 minutes away. A popular local market is held on Saturdays - again within 5 minute drive of the Villa, which is great for all those holiday souvenirs and presents for the family. 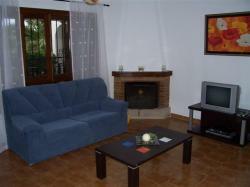 The location of this villa is perfect for a great family holiday. Two communal swimming pools and children's paddling pools and within a ten minute drive you have the choice of four golf courses or the lovely sandy beaches of La Zenia & Cabo Roig on the Costa Blanca. No need to bring your clubs as you can hire them at the courses. In addition you can also hire electric buggies. The courses all have eighteen holes, putting and chipping greens and practice areas. There are also cafeteria�s/ restaurants where you can unwind with something to eat and drink after your round. For the hard to please a 30 minute drive further south will bring you to La Manga the world famous golf resort, with three eighteen hole courses to choose from. What more can the enthusiastic golfer ask for! Torrevieja has it own Water Park Aquopolies and there is also a Water Park in Quesada which is a 10 minute drive from this property. A great day out can be had at the Rio Safari park, located on the Elche - Santa Pola road. The park has a wide range of animals on display as well as swimming pools and water slides. There are also dolphin displays to watch. Further details and prices can be had on 966 63 82 88.